Whether you avidly followed the news last week, examined every tweet, or whether you’ve never heard of them and don’t know what the fuss is about, we all owe a debt of gratitude to the Heathrow 13. As John McDonnell Shadow Chancellor of the Exchequer said from the front lines of the Willesden Magistrates Court (respect to him for being there – and to Sian Berry too – the only London Mayoral candidate present), we stand by the Heathrow 13 because they stood by us. No-one chains themselves to railings for want of something better to do.No-one risks prison for the hell of it. That this small group of people were willing to do so is testament both to their courage and to their fear. Courage in the face of the onslaught of accusations that were bound to follow on from their actions, fear that the climate is changing, that irreparable damage may already have been done and there is simply not the political will to take unpopular decisions to face this head on. What is left when the democratic process fails? Much of the legislation regarding air quality is coming from Europe – now we are faced with the possibility of Brexit, people in the UK may no longer have that protection. Species are dying out; people are dying prematurely. Londoners breathe toxic air on a daily basis. This is not speculation. It is known science. Storms and floods beyond anything we have witnessed are becoming an annual hazard. Yet the profiteers and the nay-sayers carry on their merry way. Heathrow is effectively saying, yes our air quality levels are already illegal but we can still have a third runway, put another quarter of a million planes in the sky. We’ll manage to stay within the two degree global warming limits. Maybe. Sort of. It’ll be fine. Trust us, dearie! A few weeks ago signatories to the Paris Agreement agreed to restrict global warming levels to ‘well below’ two degrees C. This ‘well below’ 2 degree target requires extensive CO2 mitigation measures which the UK Government seems to be sublimely unaware of – must be unaware of if it can even countenance more runways in any shape or form. More than this it has spent a great deal of public money on an Airports Commission to find sound business reasons why Heathrow should be chosen. Pick me! Pick me! The combination of growing demand and few technical options on the horizon that could dramatically reduce aircraft emissions means that the inability of the aviation industry to curb its environmental impact constitutes a public health risk, says Bows-Larkin. Of the Heathrow 13 George Monbiot said in the Guardian a few weeks ago they are the heroes in the struggle against political indifference to climate change. There has even been talk of them being the climate suffragists. They have our gratitude and now they have earned a break from being the thin blue line. We cannot leave it to a few brave people to shoulder this burden for us. It is everyone’s fight. Even those who are fortunate enough to live somewhere where A380s do not pass over their house at chimney pot height every two minutes. The planet will survive without us – in one form or another – it is we who cannot survive without the planet. 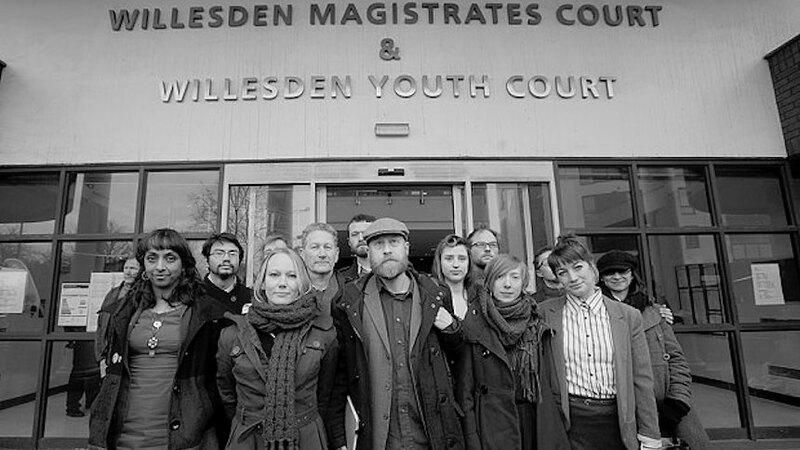 These guys are heroes – in the future it will be the big fossil fuel companies in the dock. I oppose the expansion of Heathrow, but illegal action is not the way to fight it. They caused huge cost and inconvenience to innocent people. They should have gone to prison and been forced to pay compensation. Brilliant. Absolutely great piece of writing. As for the Heathrow13 , they are priceless, and an example to bystanders looking on as people are left in desperate situations. We are all indebted to the Heathrow 13 for raising awareness of the pollution issue and the aviation industry’s push for a 3rd runway despite the fact that, even today, aviation emissions regularly breach maximum and safe levels. The industry isn’t living in a dream world – it pushes ahead with expansion plans knowing that, with current technology, it will be no more able or willing to reduce emissions to safe levels than it is today. Until the industry brings emission levels down to acceptable levels today, the idea of airport expansion should be shelved. Heathrow’s 3rd runway is just a profit-making exercise by those who have much to gain at the expense of others’ health, well-being and life expectancy. We all need to make a stand alongside the Heathrow 13, not just those directly under flight paths and not just those affected by Heathrow operations. Wherever we live, whichever airport we may live near, it’s a fact that more and more of us will be, in some way, adversely affected by airport expansion. We all live on the same planet, we should all act as #onevoice. Wow. That set it out brilliantly! I send my thanks and appreciation to all those who give up their time to try and stop this relentless push for an unsustainable environment. We all know it, but nothing really seems to be changing and a 3rd runway is a prime example of this. I have sent over 400 emails to Heathrow and I hope people will do the same. The repercussions are going to be a shock to a lot of people if they get the go ahead.